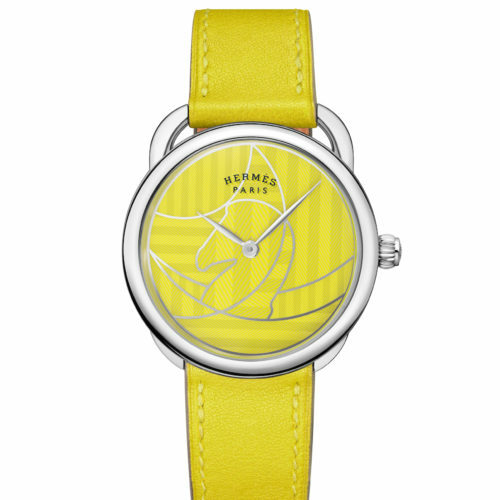 Sparkling, bejewelled and colourful, there was a definite call of the wild surrounding this year’s women’s watches. Fast becoming a signature model for Bulgari, the Divas’ Dream is inspired by the mosaics of the Roman Baths of Caracalla. 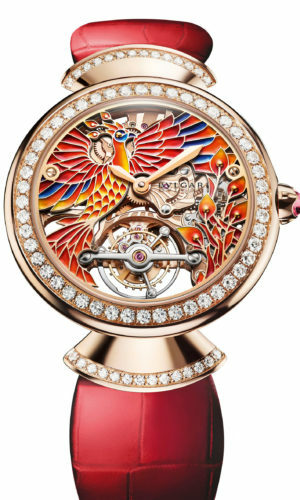 In common with all Diva watches, a geometric, petal-shape charm hangs loosely from the 37mm round, rose gold case, which houses a dial featuring a hand-painted phoenix – the legendary crimson bird that symbolises rebirth. A diamond-set bezel adds to the sumptuous look of this watch, which is as technically complex as it is aesthetically pleasing – nestled within the orangey flames on the dial is a manually winding skeleton tourbillon movement. 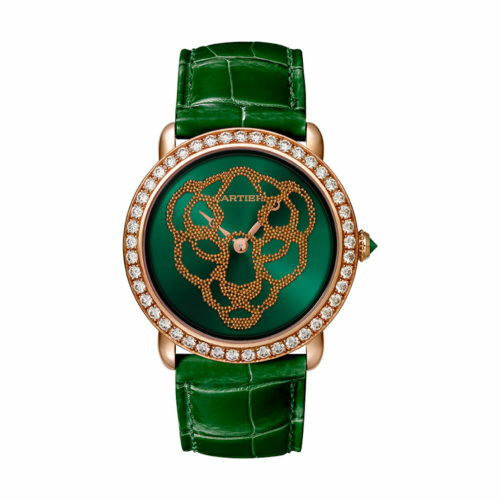 A long-time emblem of the brand, Cartier’s panther is revealed in a brand-new way in the sublime manually wound Révélation. Akin to an hourglass or a child’s toy, wrist movement is enough to set tiny gold beads into action, trickling down over the watch dial to reveal the head of the iconic big cat. The 37mm rose gold case has a bezel set with brilliant-cut diamonds and the watch is available with a black, green or red dial and a colour-matched alligator-leather strap – 100 examples of each version will be made. 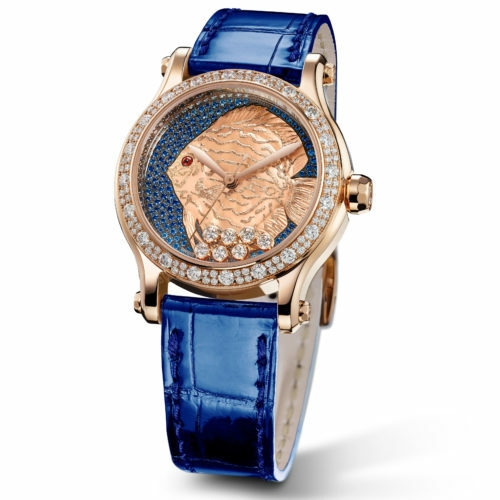 To celebrate a quarter century since Chopard took the unprecedented decision to combine diamonds with stainless steel in the Happy Sport, the brand has released the Happy Fish – one of four new limited-edition métiers d’art models. A tranquil sea composed of sapphires plays home to a dial-filling fish made from mother of pearl and gold leaf, his red jasper eye lazily watching the seven diamond bubbles that float freely alongside it. A self-winding movement is housed within a rose gold case featuring a bezel, set with three sizes of diamonds. A royal blue alligator leather strap completes the piece. 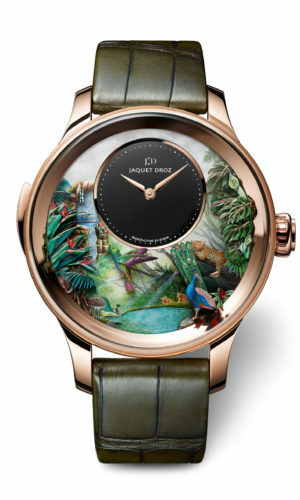 More a work of art than a wristwatch, master of the automaton, Jaquet Droz, has created yet another feast for the eyes this year with the Tropical Bird Repeater – a minute-repeating watch housed in a 47mm rose gold case and featuring a three-dimensional dial showing brightly coloured peacocks, humming birds, toucans, dragonflies and leopards against a background of tropical foliage. The scene is hand engraved and painted, and frames a black onyx sub dial bearing rose gold indexes and hour and minute hands. Despite the mechanical and visual complications, the watch has a power reserve of 60 hours. 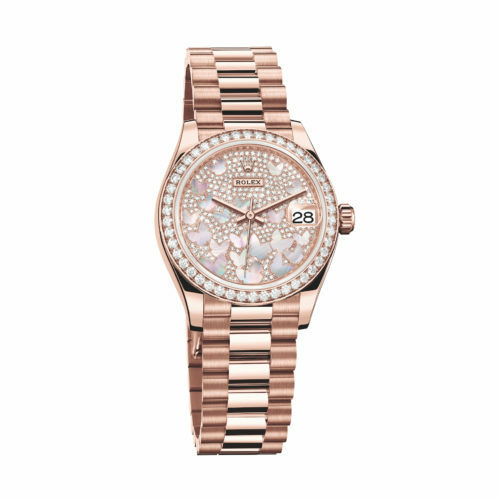 With a stunning diamond bezel and a 31mm Oyster case made from Rolex’s proprietary Everose gold, this version of the Datejust features a diamond-set dial with a kaleidoscope of delicate pink mother-of-pearl butterflies dancing across it. The date window at 3 o’clock is equipped with a cyclops lens for ease of reading. Waterproof to 100m, the watch is self-winding and has a power reserve of 50 hours. Enhancing the jewellery aspect of the piece is the beautiful Everose President bracelet with folding clasp.